Camden County Police Chief Scott Thomson hosts a press conference about suspects in the shooting of two Camden police. Credit: Matt Skoufalos. Described as ‘armed and extremely dangerous,’ Alexander Dejesus of Philadelphia and Ammar Hall and Juan Figueroa of Camden are charged in the ambush shooting of two plainclothes detectives. UPDATE (August 19, 2018): Twenty-one-year-old Juan Figueroa of Camden was arrested “without incident” in Gloucester City Saturday night, according to a statement issued by Camden County Police Chief Scott Thomson. 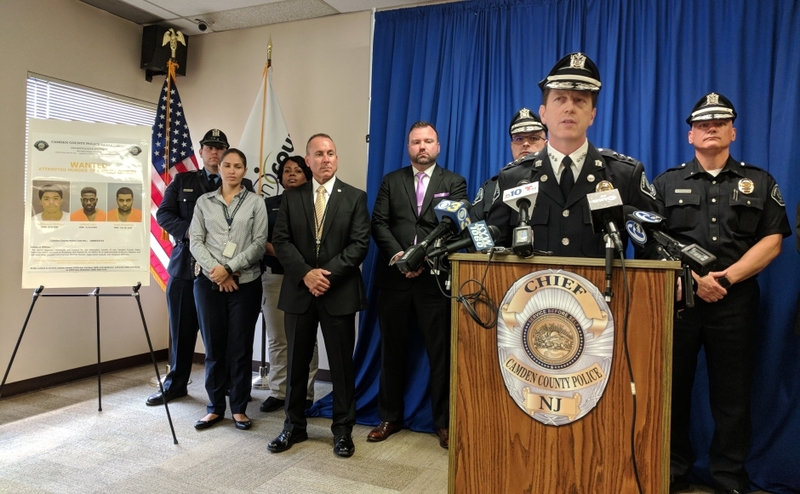 Figueroa is one of three men wanted by Camden County police (CCPD) for the alleged attempted murder of two plainclothes detectives in an August 7 shooting. 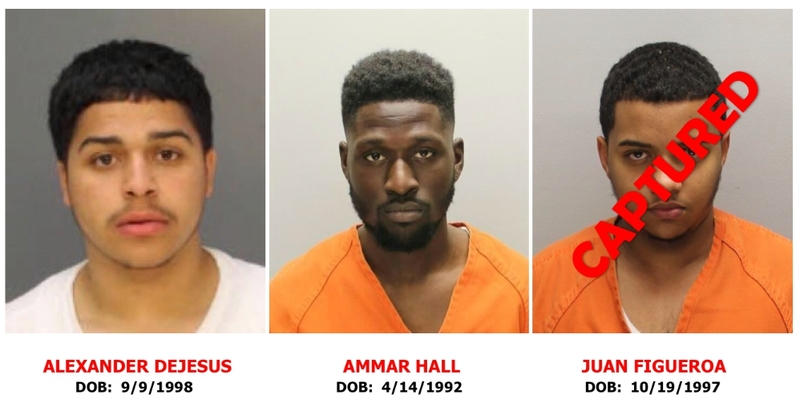 Alexander Dejesus, 19, of Philadelphia, and Ammar Hall, 26, and Juan Figueroa, 21, both of Camden, are wanted in connection with the August 7 ambush shooting of two Camden police. Credit: Matt Skoufalos. Alexander Dejesus, 19, of Philadelphia, and Ammar Hall, 26, of Camden, remain at large and are considered “armed and dangerous,” Thomson said. All three are charged with first-degree attempted murder, aggravated assault, and weapons offenses. In a briefing Friday, the Thomson described the ambush shooting of two plainclothes detectives as a harrowing surprise attack in which two assailants fired 25 rounds into an unmarked vehicle in a matter of seven seconds. Physically, the officers will recover, but the chief alluded to the psychological impact of the event. Thomson said the shooters pulled up alongside the detectives at the intersection of Broadway and Walnut Streets around 8:30 p.m. August 7. The officers were driving an unmarked car “in an undercover surveillance capacity,” he said. “They were not out making arrests, stopping cars; not doing traditional, enforcement-style work,” Thomson said. Police said the shooters jumped out of a white van, which was recovered by authorities in South Camden later that night. Although the detectives returned fire, police do not know whether any of the assailants was hit. Neither do police have a clear indication as to the motivation for the attack. All three suspects have various prior criminal histories, and although Thomson said investigators believe they are working together in some capacity, he would not comment on any potential criminal affiliations they may share. 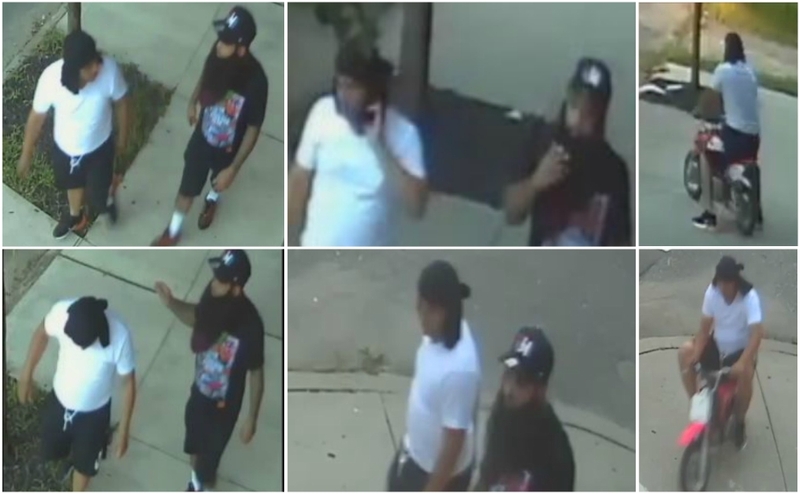 Suspects wanted in connection with the shooting of two Camden County Metro Police detectives. Credit: CCPO. The chief delivered his remarks flanked by a row of authorities from local, county, state, and federal agencies. The attack has reverberated throughout the law enforcement community, and Thomson said colleagues from throughout the country have offered their support and sympathies for the officers involved. Various agencies have posted a $60,000 reward for information leading to the arrest and conviction of the parties responsible for the attack. “Since the moment this occurred, we have not rested or slowed down in our investigative process,” Thomson said. “You have the nation’s finest law enforcement agencies standing behind me right now that have leveraged every asset and expertise that they have on this investigation. Anyone with information about the suspects is asked to call CCPD Detectives Cardoso (609-519-8598), Caffarelli (609-519-8235), or McKeown (609-820-7192). Anyone charged with a crime is presumed innocent unless and until proven guilty in a court of law. An arrest is not a conviction.